It is a common misconception that only ultra-violet light can damage art and antiques. Radiant heating is an increase in the surface temperature of the object above the ambient temperature due to the absorption of infrared radiation. This depends on the spectral power distribution of the incident light and the spectral absorptance of the material. The increase in surface temperature can cause unwanted chemical activity as well as dimensional changes, resulting in mechanical stresses when the thermal coefficients of expansion of adjacent materials in the object are not matched. Localised surface heating can also cause migration of moisture with a resultant dehydration of the artefact, resulting in surface hardening, cracking and discolouration. This will be especially visible in hygroscopic materials (i.e. most organic substances). Fig.1 shows the optical characteristics of the 'Light' version of Suspended Particle Devices electro-optic glass (trademarked as 'SPD SmartGlass' by our partners Research Frontiers). The 9mm thick sample used in these tests is a laminated glazing is fabricated with clear float glass having an interlayer which blocks UV up to 380 nm. The overall visible light transmission is 2.6% (when dark) to 62.8% (when clear). It is due to these effects of broadband light that we chose some years ago to build museum vitrines from electro-optic SPD glass to mitigate the effects of light damage. Electro-optic glass can change its transparency when stimulated by an electrical signal. Figure 1 shows the characteristics of the SPD glass we use in all ArtRatio vitrines. – The blue line indicates the light transmitted by the glass when in its default inactive state (opaque). – The red line shows the light transmitted by the glass when it is activated (i.e. transparent). a. The horizontal axis of Fig.1 shows the wavelength of electromagnetic radiation, measured in nanometres (nm), from 300nm which is in the ultra-violet part of the spectrum to 1000nm (well into the infrared). The visible spectrum extends from 380nm to 740nm. The vertical axis shows the amount of light transmitted by the glass, as a percentage. b. 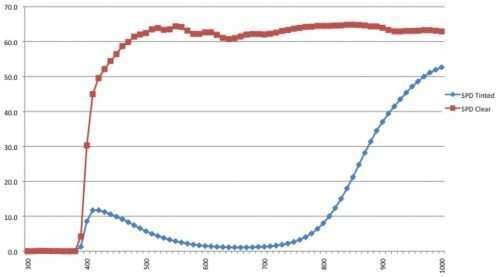 The blue line shows minimal transmission of light across the visible spectrum with a 12% transmittance peak at 420nm, giving the glass a slight blue tint in the off state when it is opaque. The glass limits the IR to 50% when opaque, which means that half of the radiant heating effects are eliminated when the glass is inactive (which from our experience is most of the time). That is why our vitrines measure the popularity of the work of art (in total seconds viewed), so we can factor in how much time we can expect to be illuminating the object at different times of the year. c. The red line shows a fairly uniform (flat) distribution of light transmitted when the glass is activated, proving that the glass – when transparent – apportions no extra colouration to the artefact. The transmittance in this state exceeds 60% across the entire visible spectrum but please note that the glass is also transmitting IR when activated. This is why we also monitor the temperature inside the vitrine at all times and flag any sudden increases in the conservation data. Read our article Art in the Age of Analytics for thoughts on the technological impacts of isolated data in the Art World.